Need another quick and unforgettable side dish for your Thanksgiving Dinner? 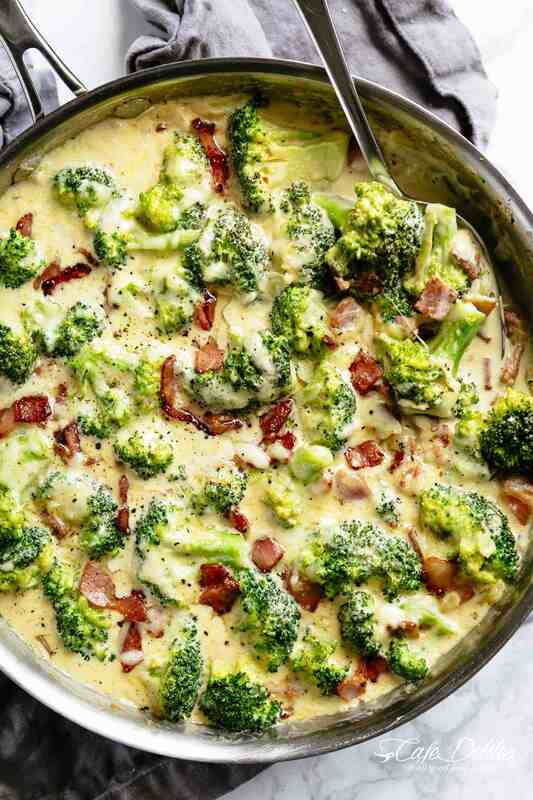 Here is a great broccoli and bacon dish! This is sure to be a crowd pleaser! ~Preheat broiler (on medium heat of you have the option). ~Fry the bacon in a large oven-safe skillet over medium heat until crispy. ~Use a slotted spoon to transfer to a paper towel lined plate to soak up some of the oil. Set aside. ~Drain most of the bacon fat from the pan, leaving about 1-2 tablespoons for added flavor (adjust this amount to your liking). ~In the same pan, melt the butter, add the onion and cook until transparent (about 2 minutes), while scraping up any browned bits leftover from the bacon. ~3 minutes, or until just turning vibrant in color. ~Add in the garlic and stir it through the broccoli for 30 seconds, until fragrant. ~Add the bacon and give everything a good mix to combine all of the flavors together. ~Top with the mozzarella and Parmesan cheeses. ~Broil until cheese is bubbling and golden, and broccoli is done to your liking (about 2-3 minutes). ~Season with a little extra pepper, if desired, before serving. You can also sprinkle with fresh chopped parsley, thyme or rosemary. Thank you to Cafe Delites for this delicious dish. Click Here to print this recipe.